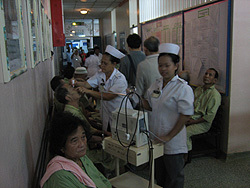 The ophthalmology service is poorly developed in Sarawak compared with West Malaysia. There are only 8 ophthalmologists capable of operating independently in the government hospitals and these specialists are found in the three largest towns in Sarawak: Kuching (6); Sibu (1) and Miri(1). Consequently, a great number of rural people have problems accessing ophthalmic health care. 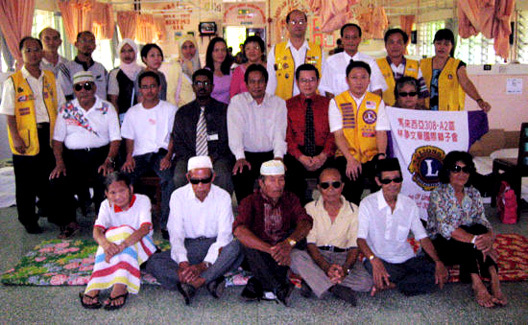 To a small degree, these problems are alleviated through the Cataract Campaigns organized jointly by the Sarawak Society for the Blind and the Lion's Club. 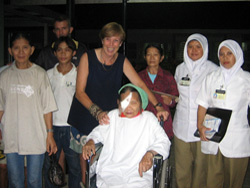 The campaign began in 1990 and about 1250 cataracts had since been performed. 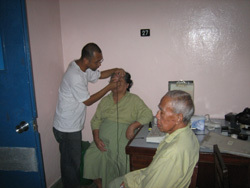 This weekend the campaign concluded its 47th Cataract Operation which was carried out in Limbang Hospital. 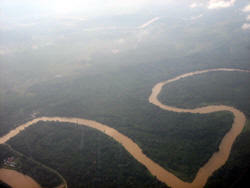 Limbang is situated at the eastern part of Sarawak wedged between the two halves of the Kingdom of Brunei. 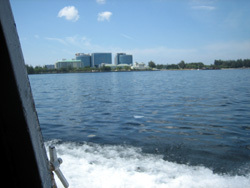 Miri is the nearest town where cataract surgery can be performed. To gain access to Miri, patients need to travel either by air which takes 30 minutes or by road through Brunei which takes 3 hours. Unfortunately, a lot of the rural poor could ill afford the expenses for the journey and stay. 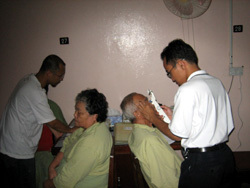 Most of the ophthalmic problems in Limbang were treated by the medical assistant who had received basic ophthalmology trainings. 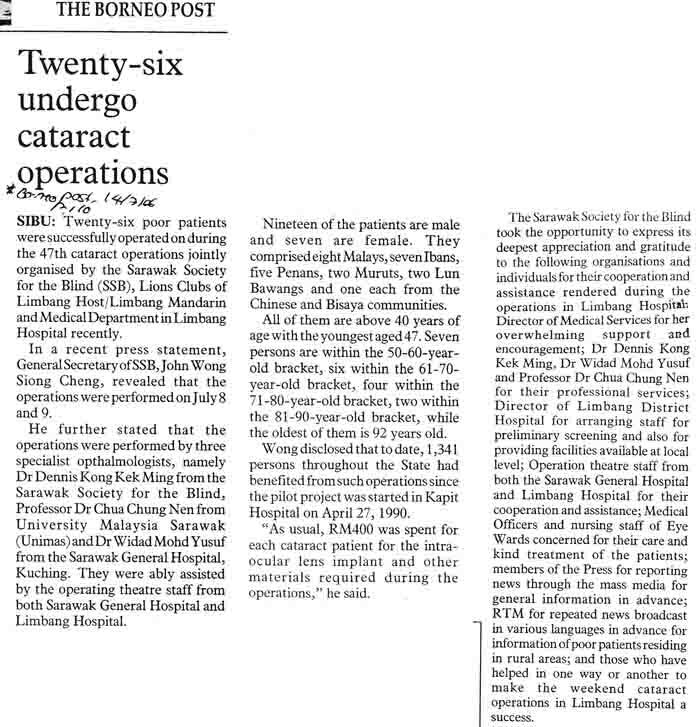 The Cataract Campaign consisted of staff from the Sarawak General Hospital (Dr. Widad, 4 nurses and 1 optician), UNIMAS (Professor Chua and Nurse Salbiah) and one private ophthalmologist (Dr. Dennis Kong from the Normah Hospital). The team set off at noon on Friday with portable screening devices, biometry, operating microscope, intraocular lenses (20 - 24D) and surgical instruments for ECCE + IOL. The whole journey was smooth and the team arrived in Limbang at 5pm. 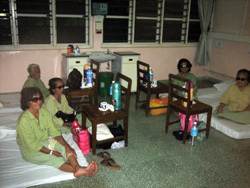 After a welcoming dinner in the Limbang Hospital, 36 patients who had been screened by the medical assistants in Limbang Hospital as potential candidates for cataract surgery were examined by the ophthalmologists for their suitability for operations. 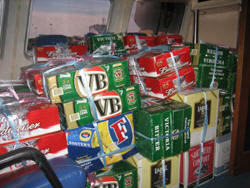 26 patients were listed for the operation. The first operation began at 9pm and 5 uneventful cataract extraction with intraocular lens implants were completed by 11pm. The operation resumed at 8:30am on Saturday. The non-operating ophthalmologists examined the post-operative patients plus 25 patients with miscellaneous problems from 8:30am till 11:00am. 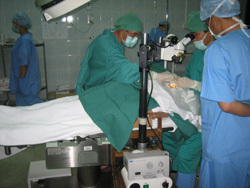 21 cataract operations were performed between 8:30am and 7:30pm by the three ophthalmologists. 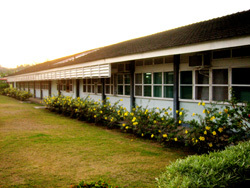 All the patients were kept in the ward and reviewed the next day. 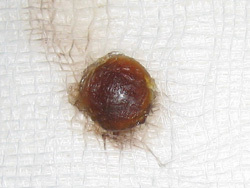 Of the 26 cases, only one patient did not have implantation because of vitreous loss from posterior capsule rupture. The plan was for the patient to travel to Kuching for anterior vitrectomy and secondary anterior lens implant at the Lion's Club expenses. 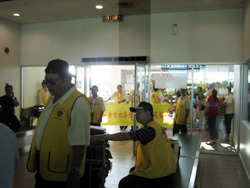 Checking in at Kuching International Airport. 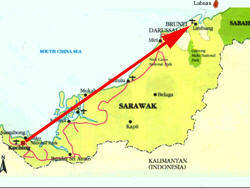 Map showing the flight path from Kuching to Limbang. 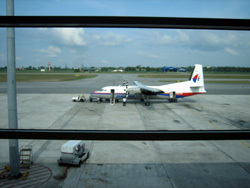 Change at Miri Airport for Fokker to Limbang. Warm welcome from the Lion's Club. 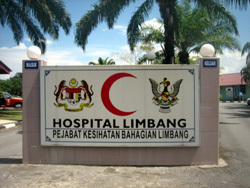 Limbang Hospital where the action was. 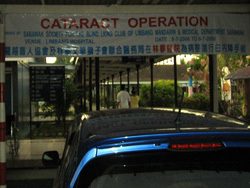 Banner announcing the Cataract Campaign. 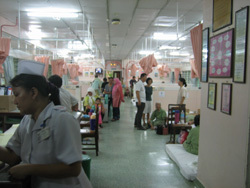 Patients waiting to be examined. Nurses instilling dilating drops and checked blood pressure and other vital signs. Makeshift beds for cataract patients. 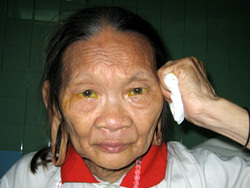 A Penan lady with cataract. 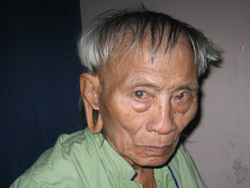 The elongated and perforated earlobes are the results of long-term wearing of heavy ear rings. 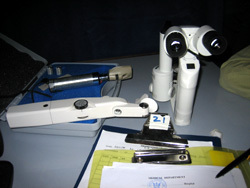 Portable microscope mounted to a chair. 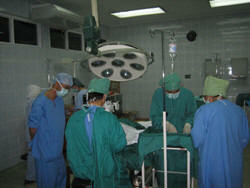 Operating team in Limbang Hospital theatre. 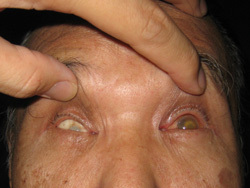 A brownish black lens typically of the cataract operation. Voluntary worker Ms Libby O'Connor with Bungan Upa - a Penan elder from the forest. 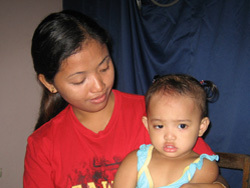 Baguam underwent a successful right ECCE + IOL. 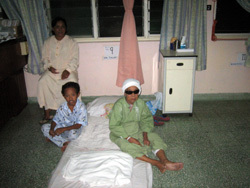 Post-cataract patients at the makeshift beds. 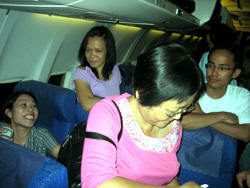 A post-operative patient with relatives. A little girl with right ptosis. Operation to be in Kuching. Some patients could not be helped. This patient has a right phthisical eye and left total retinal detachment from poorly controlled diabetes. 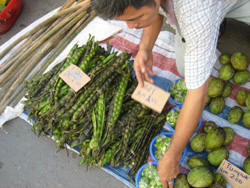 A visit to the Sunday Market in Limbang. Some returning visitors were stalking up for the Sunday World Cup Final. Farewell lunch on Monday 10/7/2006. 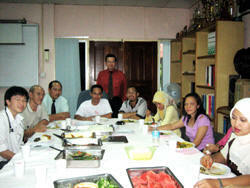 Group session with some of the patients, staff of Limbang Hospital and Limbang Lion's Club. 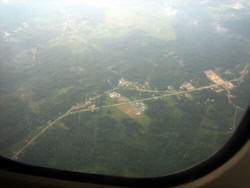 Arriving in Kuching at 8pm.